The ITC range of interchangeable torque sensors specially adapted for the Vortex test system. Plug and play for automatic calibration and a range of capacities for all requirements, from 0.3 N.m (2.7 lbf.in) to 10 N.m (90 lbf.in). The ITC range of interchangeable torque sensors is specially adapted to the Vortex-i and -xt test systems. Each sensor is fitted with a ⅜" male square drive for connection to a range of fixing tables and chucks to hold your specimens. To ensure that you have the optimum selection to meet all your torque testing needs, five different sensors are available. All sensors measure from zero and cover the range from 0.3 N.m right up to 10 N.m.
Each sensor reads from zero to its full nominal capacity (listed below). Measurement accuracy is an outstanding ±0.5% of the sensor capacity. Torque screwdrivers are designed to eliminate under and over-tightening by slipping when applying a fixed torque. 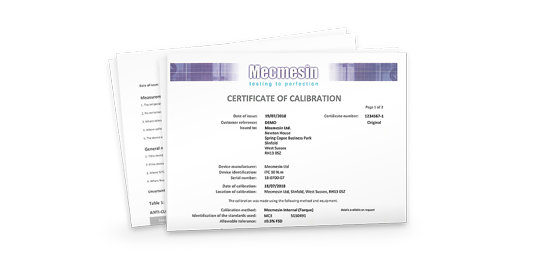 To ensure they perform correctly and reliably, they must be checked and calibrated regularly. Manual methods of calibration are highly time-consuming and can be influenced by different operators. This makes it expensive to check large numbers of tools, as well as putting staff at risk of repetitive strain injuries. The TSCC is based on Mecmesin’s Vortex-xt automated torque tester. Designed to eliminate the variability associated with manual calibration methods, this system uses the highest quality certified torque cells and a pre-set speed to guarantee optimum accuracy and repeatability. A universal test fixture makes it easy to mount all sizes of torque screwdriver, ensuring consistency when checking different tool types. With simple and intuitive operation controls, a torque test is completed at the push of a button - keeping operator training and testing time to a minimum. Typically taking three torque measurements per tool in under thirty seconds, this torque screwdriver check calibrator provides instant pass/fail indication to the operator. Adjusting the pre-set mechanism in the tool can be done on-the-spot and retested immediately. A handy touch-screen console on the side of the machine stores all your pre-programmed tests and collects the data for export and reporting functions. A barcode reader is even available for scanning tool ID’s which are automatically registered in the software of the tester for inclusion in test reports.